For three years, my family and I struggled with the feeling that that we were always guests and never home. In actuality, we had entered Grandparent Season. This is the season when grandparents need increased caregiving. For us, it happened all at the same time. While one grandfather was going through cancer treatments, another grandmother was learning to cope with her new state of blindness. This almost instantly resulted in one set of grandparents temporarily moving into our home, and several of us temporarily moving away to care for the blind grandmother. Though Grandparent season hasn’t ended for us yet, those first three years were particularly challenging as we learned to navigate through this new time of life. For example, the emotional stresses were very evident, as it’s not easy watch loved ones lose their ability to live on their own, or battle with an overcoming illness. Amid the many trials presented during Grandparent Season, one of them was learning to adjust to frequent change and travel. It's not an unusual thing to experience life as a guest. In fact, as Christians we know that this earth is not our home. So, in a sense, we are guests in our own temporary earthly home. We are “sojourners” (I Peter 2:11) who “seek the city that is to come” (Hebrews 13:14). Jesus is preparing a place for us, and one day He will come again and take us to Himself (John 14:1-7). These are beautiful and hopeful truths! They are truths that, when fully embraced, help us navigate through the changes that naturally come with having aging loved ones move in, or visit longterm. Opening your life to caregiving, can create the feeling of being a guest in your own home. Living like a guest in our own earthly home doesn’t bother us nearly so much when we realize this simple fact: we are a guest in our homes already. Once we grasp the truth that this world is not our home, we can walk in freedom, even in the midst of what seems like chaos. If caregiving for an aging loved finds you with an additional longterm guest or requires you to travel a lot to visit them, here are three steps to remember. Also remember that your elderly family member is presented with their own, very difficult challenges as they are forced to release independence and often deal with great, physical ailments. This is a new season of life, which probably means finding a new normal. Maybe it means changing schedules, adjusting routines, or canceling plans. In the case of a loved one with medical needs, you may be bandaging oozing wounds or cleaning up the messes that come from chemo. Whatever you do, don?t panic. Be flexible. And adjust accordingly. Simplify your schedule, and remember that even this is only temporary. My grandfather was a WWII veteran, but never talked much about the war. As he battled cancer while living in our home, we were able to take advantage of those rare moments when he did open up. He allowed us to film sometimes, and now we have those treasures on tape. Before he died in our home, each of us had the opportunity to talk with him, speak of Christ with him, love on him, remember the memories with him. At the same time, his beloved wife of over 60 years could be supported as she faced the reality of becoming a widow. This season presented treasured times, which were only made possible in the crucible of suffering and change. 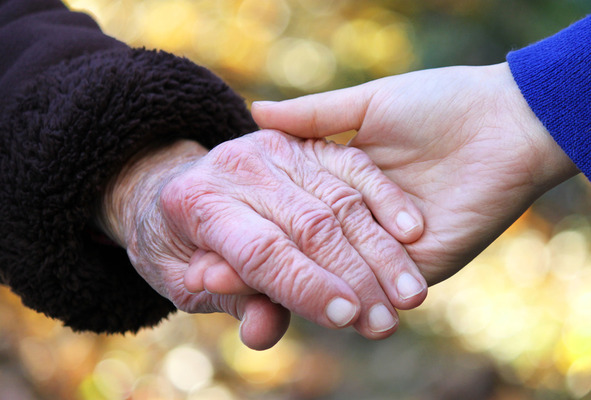 Admittedly, as the needs of grandparents seemed to emerge all at the same season of life, I felt at times very overwhelmed by the upheaval, change, and weight of caregiving. But honestly, I wouldn’t trade a minute. God sovereignly gave us temporary moments, on this temporary earth, in our temporary homes, with temporary opportunities to serve our loved ones. Yet, the repercussions of that temporary season of life will last for all of eternity.